My first published work, "TROPHY" has been reprinted again in The Conan Reader. One of my favorites! 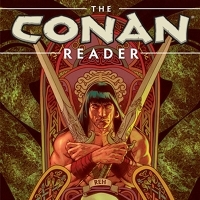 A vast hoard for the taking, collecting Conan one-shots, short stories, and miniseries from the finest creators in all of graphic fiction, including Kurt Busiek, P. Craig Russell, Fred Van Lente, Kelley Jones, Ariel Olivetti, Dave Stewart, and many, many more. Nearly 700 pages of clashing swords, malefic wizardy, and forgotten kingdoms! Collects Conan and the Jewels of Gwahlur, Conan: Book of Thoth, Conan and the People of the Black Circle, Conan and the Songs of the Dead, Conan: The Blood-Stained Crown and Other Stories, and Conan: The Daughters of Midora and Other Stories.